Gordon Strachan said he had all but decided before the final Euro 2016 qualifier with Gibraltar he would stay on as Scotland manager. Strachan's side finished fourth in their qualifying group behind Germany, Poland and the Republic of Ireland. However, Strachan was sure he wanted another chance to try and lead Scotland to their first finals since France 98. 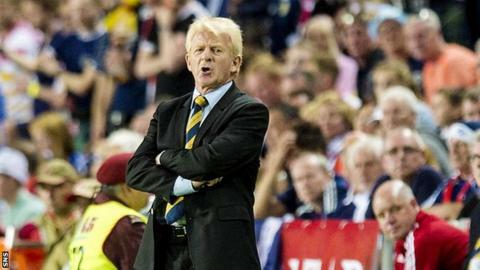 "I was 80 or 90% sure that I wanted to do it again," Strachan told BBC Scotland's Sportsound. There were doubts over Strachan's future after Scotland failed to beat Poland in their penultimate qualifier, which meant their European Championship hopes were over before the final game. That did not stop Strachan being given a hero's reception by the Scotland support during the 6-0 win in Faro. "There's no doubt about it the European Championships are going to be worse off without us being there." Strachan, 58, also believes his team are better than many of the sides who qualified for the finals in France next summer. "I would say definitely, absolutely definitely," said Strachan. "It just so happens you can be in a tougher section. Second and third in our group couldn't beat us. "We were 10 seconds away from beating Poland, and Ireland never beat us, but they produced results against Germany. "Wales have got (Gareth) Bale and (Aaron) Ramsey who are two world class players. If you take (Robert) Lewandowski out of the Poland team, we qualify." Scotland lost just three times in the group - twice to world champions Germany. Strachan though feels it was the 1-0 defeat to Georgia in Tbilisi that made the difference, but said he would not have done anything differently. "It came down to seven passes against Georgia," he said. "People say we could have played quicker - no we couldn't. When teams play everyone behind the ball you have to take your time, because you can not move the ball quickly if they do not come at you quickly, it's impossible to do that. "For anyone to say otherwise is nonsense. I'll take anyone to a training session and show you how to slow a game down. "We played in the first half against Georgia like we did against Poland. The difference being (Steven) Fletcher's pass got to (Ikechi) Anya and Anya's pass made it to (Shaun) Maloney. We got to where Anya was seven times against Georgia but we could not produce the pass." The World Cup qualifiers begin in September with Scotland facing England, Slovakia, Slovenia, Lithuania and Malta in their attempt to make the tournament in Russia, and Strachan has challenged players on the periphery of the squad to prove they are worthy of a place. "I will not just put people in who, one, do not deserve a Scotland cap, and secondly are not better than the ones we've got already," he said. "People will be given a chance, but people have been given a chance before by coming to the squad, but if you're not better (than the ones already in the squad) then you can't stay in the squad."